If you are going to apply for a Retail supervisor role at a retailer or supermarket then you may need to write a covering letter for your application. There are many Retail supervisor job vacancies across the country on the job sites online. All you need to visit them and start searching for current vacancies. One of the best job search sites for retail supervisor jobs are cv-library.co.uk, totaljobs.com, reed.co.uk and of course Learnist.org the one that you are currently on. You can use following Retail Supervisor job application letter after editing the company details, job title and all others that need editing and then you should add your contact details to the letter so they can reach you whenever they wanted to. 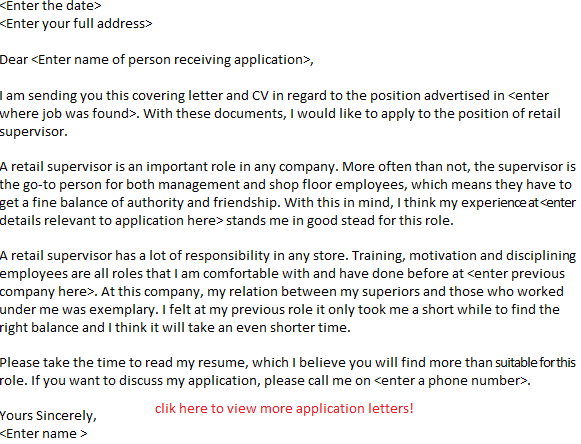 Click here to view the Retail Supervisor covering letter in text so you can copy and edit easily. Click here to download the cover letter in doc format.